Midwives College of Utah (MCU) is committed to the vision that every family deserves a midwife. The MCU curriculum is firmly grounded in the unique and profound power of the Midwives Model of Care™ as a primary pathway for improving outcomes and eliminating inequities for pregnant persons and their babies during the childbearing year. Between 2004 to 2014, out-of-hospital (OOH) birth increased by 72%, and rates of prematurity and low birth weight among OOH deliveries were notably low. This incredible news helps to acknowledge the dedicated work of students, midwives, and midwifery education in improving maternal-infant health outcomes and increasing access to home- and birth center-based care. 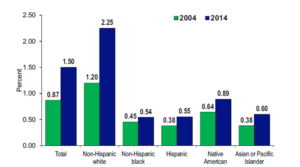 However, the increase in OOH birth rates and associated lower risk profiles were driven primarily by white, middle class women (see Figure 1 below). Since OOH birth has a lower risk profile than hospital birth and the midwifery model of care is associated with positive outcomes overall, underrepresented families are not receiving the benefits of midwifery care and out-of-hospital birth to the extent of their white counterparts. Concurrently, families of color, low-income families, queer-identified families, and other marginalized communities remain at greater risk for maternal-infant morbidity and mortality due to systemic oppression. Identified inequities are incongruent with the principles of the Midwives Model of Care™ and MCU’s vision for the future of midwifery in which equity and social justice prevail. Fig. 1. 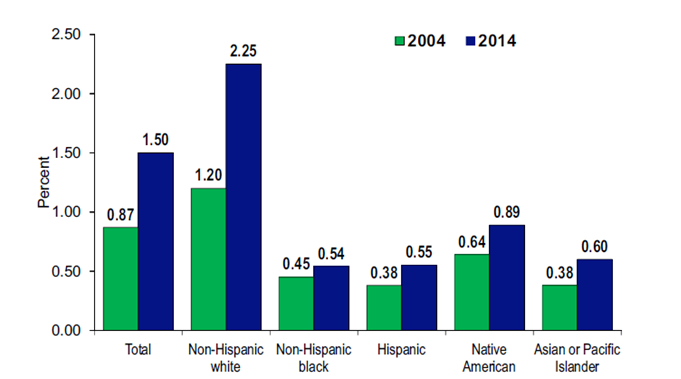 Percent of out-of-hospital births by race/ethnicity, United States, 2004 and 2014. Percent of total United States births. Source: Authors’ calculations based on United States birth certiﬁcate data (25). MCU acknowledges the known associations between midwifery care access and midwifery education/training, where a lack of diversity within the midwifery profession is associated with a less diverse clientele population. In an effort to decrease evident inequities among marginalized communities and ensure all families have access to the benefits of midwifery care, midwifery educators must take explicit action to improve the diversity of the profession and implement educational and clinical agendas committed to cultural humility, social justice, and health equity. Existing barriers to the obtainment of midwifery education occur dynamically at both micro- (individual) and macro- (institutional) levels, and only through removal of identified barriers and the addition of meaningful support systems will the midwifery profession achieve the principles of equity and social justice. To this end, MCU is committed to undertaking a holistic approach to diversity initiatives within our educational system and profession at large, working with internal and external stakeholders to identify barriers and implement best practices that serve our underrepresented communities, decrease inequities among marginalized communities, and ensure inclusivity in education as well as midwifery care. Identify and assess the barriers and needs that exist for underrepresented students in entering and successfully moving through the program. Require anti-racism and anti-oppression trainings institution wide (students, faculty, staff, Board of Directors, and preceptors) with emphasis on incorporating inclusive and diverse pedagogical approaches within the curriculum and in our student support services. Evaluate barriers, identify best practices, and implement proactive approaches to increasing the recruitment and retention of faculty from underrepresented communities through local, national and international organizations. Based on identified barriers and needs, increase the number of support services offered that specifically target and meet the unique needs of underrepresented communities in an effort to increase their recruitment, retention and success in midwifery education and training in the field. Collaborate with organizations such as ACNM, NACPM, AME, ICTC, MANA, MEAC and NARM, all of which are working to eliminate inequities within midwifery and midwifery education. Engage ongoing evaluation of our educational offerings, including the curricula of the BSM and MSM degree programs, to ensure evidence-informed approaches that are meaningful to the communities we wish to serve; improve our educational system based on continual self-reflection and evaluation results. Please read MCU’s Non-Discrimination Policy. During the 2012 CPM Symposium, midwives and individuals of color shared their experiences of “working and living as midwives, educators, consumers, parents and advocates in a society plagued with racism that devalues and creates barriers in their lives, roles and contributions to practicing effectively and to serving their community” (NACPM, 2012). MCU is a committed ally to all underrepresented families who seek access to midwifery care and to those who strive to become midwifery providers within their communities. Through collaboration and humble listening, we will continually strive to remove existing barriers to recruitment, retention, support and success at MCU, as well as advance our program and profession in achieving inclusivity, cultural humility, and health equity. In doing so, we hope to broaden the reach and benefits of midwifery care for all families and effect widespread social change in the midwifery profession. Apply now for MCU’s Briana Blackwelder Equal Access Scholarship Fund. Renee Ametane’e Roman Nose, Cheyenne, M.A.I.S. MacDorman MF, Declercq E. Trends and Characteristics of United States Out-of-Hospital Births 2004-2014: New Information on Risk Status and Access to Care. Birth Berkeley Calif. 2016;43(2):116-124. doi:10.1111/birt.12228.